The three members of MOTU grew up in Frederick, Maryland. Each member, coming from very different musical backgrounds, had no idea that they would come together after graduating from college and would form one of the most flexible bands in Frederick. Why the name Masters of the Universe? At first thought, you may think that they're narcissistic egomaniacs. Quite frankly, they are and it comes through in their music. MOTU's main goal is to rock any venue, whether it be the smokey, gritty bar scene to the lavish acoustical coffee houses. 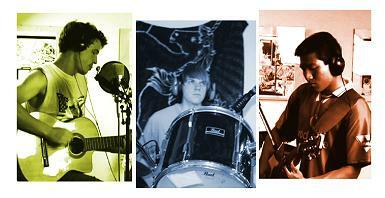 They pride themselves with their original compositions, but they also put a lot of work in picking their covers. MOTU enjoys playing classic hits such as Jimi Hendrix to awesome eighties anthems such as Fine Young Cannonballs. They currently perform all over MD,VA, and DC. Kelly has been hitting the skins since middle school, when he fell in love with jazz greats such as Billy Cobham, Buddy Rich, and Max Roach. Rock lessons through high school and jazz lessons in college set him up to fall in love with funk and it's faster, jazzier cousin, fusion. A few of his eclectic musical influences are Mike Clark (Headhunters), Herbie Hancock, George Benson, Stevie Wonder, Paul Chambers, George Gershwin, Steely Dan, The Talking Heads, Radiohead, Beck, George Clinton and Parliament Funkadelic, The Rza, the Pixies, and the Beatles. His favorite producers are Teo Macero, Rick Rubin, Nigel Godrich, Dan the Automator, Amon Tobin, and DJ shadow. Kelly lives in Gaithersburg, Md. and is in the process of moving to Baltimore, Md. Bing Kung does not have a lot of facial hair. He shaves about once every two weeks. Instead of growing stubble, his face grows whiskers. When the whiskers get long enough, he will pluck and tune them to the right frequencies and use them on his guitar. You can hear these magical whiskers used in various songs in the Media section of the website. Aidan learned John Prine and The Band songs from his dad growing up. He played in coffee houses around his college town of Baltimore, honing a raw delivery and obscure lyrical bent. When not teaching Tech Ed in 7th grade he can be found listening to Bob Dylan, Warren Zevon, Neil Young, and Yo La Tengo.